Ketoconazole shampoo, 2%, is a red-orange liquid for topical application, containing the broad spectrum synthetic antifungal agent ketoconazole in a concentration of 2% in an aqueous suspension. It also contains: sodium laureth sulfate, disodium laureth sulfosuccinate, cocamide diethanolamide, hydrochloric acid, PEG-120 methyl glucose dioleate, imidurea, sodium chloride, sodium hydroxide, fragrance, FD&C red No. 40, and purified water. Tinea (pityriasis) versicolor is a non-contagious infection of the skin caused by Pityrosporum orbiculare (Malassezia furfur). This commensal organism is part of the normal skin flora. In susceptible individuals the condition is often recurrent and may give rise to hyperpigmented or hypopigmented patches on the trunk which may extend to the neck, arms and upper thighs. Treatment of the infection may not immediately result in restoration of pigment to the affected sites. Normalization of pigment following successful therapy is variable and may take months, depending on individual skin type and incidental skin exposure. The rate of recurrence of infection is variable. Ketoconazole was not detected in plasma in 39 patients who shampooed 4-10 times per week for 6 months, or in 33 patients who shampooed 2-3 times per week for 3-26 months (mean: 16 months). An exaggerated use washing test on the sensitive antecubital skin of 10 subjects twice daily for five consecutive days showed that the irritancy potential of ketoconazole shampoo, 2%, was significantly less than that of 2.5% selenium sulfide shampoo. A human sensitization test, a phototoxicity study, and a photoallergy study conducted in 38 male and 22 female volunteers showed no contact sensitization of the delayed hypersensitivity type, no phototoxicity and no photoallergenic potential due to ketoconazole shampoo, 2%. Mode of Action: Interpretations of in vivo studies suggest that ketoconazole impairs the synthesis of ergosterol, which is a vital component of fungal cell membranes. It is postulated, but not proven, that the therapeutic effect of ketoconazole in tinea (pityriasis) versicolor is due to the reduction of Pityrosporum orbiculare (Malassezia furfur) and that the therapeutic effect in dandruff is due to the reduction of Pityrosporum ovale. Support for the therapeutic effect in tinea versicolor comes from a three-arm, parallel, double-blind, placebo controlled study in patients who had moderately severe tinea (pityriasis) versicolor. Successful response rates in the primary efficacy population for each of both three-day and single-day regimens of ketoconazole shampoo, 2%, were statistically significantly greater (73% and 69%, respectively) than a placebo regimen (5%). There had been mycological confirmation of fungal disease in all cases at baseline. Mycological clearing rates were 84% and 78%, respectively, for the three-day and one-day regimens of the 2% shampoo and 11% in the placebo regimen. While the differences in the rates of successful response between either of the two active treatments and placebo were statistically significant, the difference between the two active regimens was not. Microbiology: Ketoconazole is a broad spectrum synthetic antifungal agent which inhibits the growth of the following common dermatophytes and yeasts by altering the permeability of the cell membrane: dermatophytes: Trichophyton rubrum, T. mentagrophytes, T. tonsurans, Microsporum canis, M. audouini, M. gypseum and Epidermophyton floccosum; yeasts: Candida albicans, C. tropicalis, Pityrosporum ovale (Malassezia ovale) and Pityrosporum orbiculare (M. furfur). Development of resistance by these microorganisms to ketoconazole has not been reported. 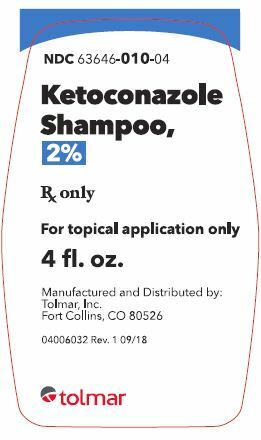 Ketoconazole shampoo, 2%, is indicated for the treatment of tinea (pityriasis) versicolor caused by or presumed to be caused by Pityrosporum orbiculare (also known as Malassezia furfur or M. orbiculare). Note: Tinea (pityriasis) versicolor may give rise to hyperpigmented or hypopigmented patches on the trunk which may extend to the neck, arms and upper thighs. Treatment of the infection may not immediately result in normalization of pigment to the affected sites. Normalization of pigment following successful therapy is variable and may take months, depending on individual skin type and incidental sun exposure. Although tinea versicolor is not contagious, it may recur because the organism that causes the disease is part of the normal skin flora. 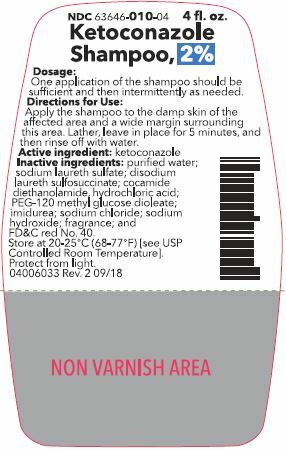 Ketoconazole shampoo, 2%, is contraindicated in persons who have known hypersensitivity to the active ingredient or excipients of this formulation. Severe hypersensitivity reactions, including anaphylaxis, have been reported during post-marketing use of ketoconazole shampoo, 2%. If a reaction suggesting sensitivity or chemical irritation should occur, use of the medication should be discontinued. Ketoconazole shampoo, 2% may be irritating to mucous membranes of the eyes and contact with this area should be avoided. The following have been reported with the use of ketoconazole shampoo, 2%: hair discoloration and abnormal hair texture, removal of the curl from permanently waved hair, itching, skin burning sensation and contact dermatitis, hypersensitivity, angioedema, alopecia, rash, urticaria, skin irritation, dry skin, and application site reactions. Patients who develop allergic reactions, such as generalized rash, skin reactions, severe swelling, angioedema, or shortness of breath should discontinue ketoconazole shampoo, 2% and contact their physician immediately. Long-term studies to assess the carcinogenic potential of ketoconazole shampoo, 2% have not been conducted. A long-term feeding study of ketoconazole in Swiss Albino mice and in Wistar rats showed no evidence of oncogenic activity. The dominant lethal mutation test in male and female mice revealed that single oral doses of ketoconazole as high as 80 mg/kg were not genotoxic. The Ames Salmonella microsomal activator assay was also negative. There are no adequate and well-controlled studies in pregnant women. Ketoconazole should be used during pregnancy only if the potential benefit justifies the potential risk to the fetus. In humans, ketoconazole is not detected in plasma after chronic shampooing on the scalp. Ketoconazole has been shown to be teratogenic (syndactylia and oligodactylia) in the rat when given orally in the diet at 80 mg/kg/day (a dose 10 times the maximum recommended human oral dose). However, these effects may be related to maternal toxicity, which was seen at this and higher dose levels. There are no adequate and well-controlled studies in nursing women. Ketoconazole is not detected in plasma after chronic shampooing on the scalp. Caution should be exercised when ketoconazole shampoo, 2%, is administered to a nursing woman. In 11 double-blind trials in 264 patients using ketoconazole shampoo, 2%, for the treatment of dandruff or seborrheic dermatitis, an increase in normal hair loss and irritation occurred in less than 1% of patients. In three open-label safety trials in which 41 patients shampooed 4-10 times weekly for six months, the following adverse experiences each occurred once: abnormal hair texture, scalp pustules, mild dryness of the skin, and itching. As with other shampoos, oiliness and dryness of hair and scalp have been reported. In a double-blind, placebo-controlled trial in which patients with tinea versicolor were treated with either a single application of ketoconazole shampoo, 2%, (n=106), a daily application for three consecutive days (n=107), or placebo (n=105), drug-related adverse events occurred in 5 (5%), 7 (7%) and 4 (4%) of patients, respectively. The only events that occurred in more than one patient in any one of the three treatment groups were pruritus, application site reaction, and dry skin; none of these events occurred in more than 3% of the patients in any one of the three groups. Because these reactions are reported voluntarily from a population of uncertain size, it is not possible to reliably estimate their frequency. The following adverse drug reactions have been identified during post-marketing experience with ketoconazole shampoo, 2%: there have been reports of hair discoloration and abnormal hair texture, itching, skin burning sensation, contact dermatitis, hypersensitivity, angioedema, alopecia, rash, urticaria, skin irritation, dry skin, and application site reactions. Ketoconazole shampoo, 2%, is intended for external use only. In the event of accidental ingestion, supportive and symptomatic measures should be employed. Induced emesis and gastric lavage should not be performed to avoid aspiration. Apply the shampoo to the damp skin of the affected area and a wide margin surrounding this area. Lather, leave in place for 5 minutes, and then rinse off with water. One application of the shampoo should be sufficient. Ketoconazole Shampoo, 2%, is a red-orange liquid supplied in a 4-fluid ounce nonbreakable plastic bottle (NDC 63646-010-04). Storage conditions: Store at 20-25ºC (68-77ºF) [see USP Controlled Room Temperature]. Protect from light.